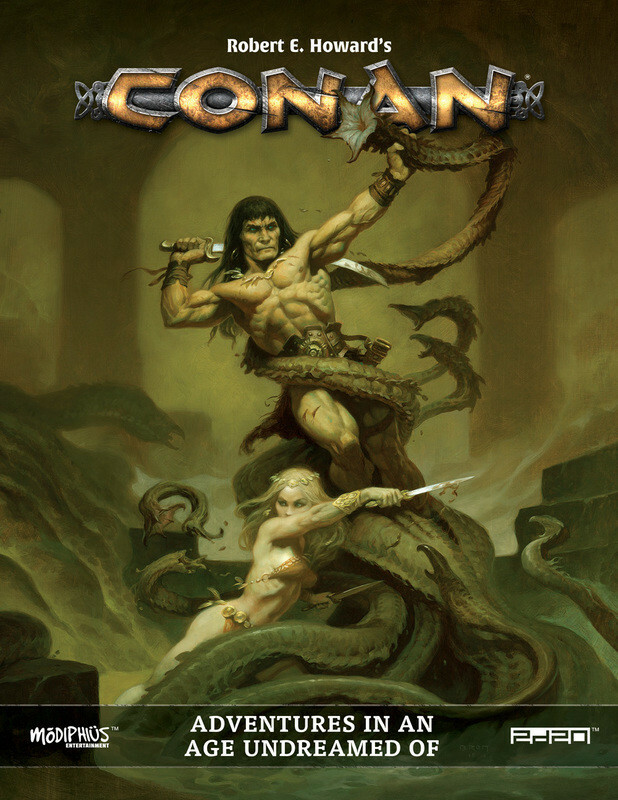 Full Disclosure: I was given a PDF copy of Conan: Adventures in an Age Undreamed Of to review by Modiphius Entertainment. Marvel Comics' Conan was one of the earliest comics I ever bought. To this day, Roy Thomas and John Buscema, in may ways, define Conan for me. After discovering Robert E. Howard's connection to the Cthulhu Mythos, I finally started reading the original stories and have grown to love them. I've watched the films and even the cartoons. I remember when I got my Wonder Bread He-Man with the black hair and finally noticing that the whole line had a Conan vibe. And lastly, but probably most importantly, Cross Planes is named after Howard's home town of Cross Plains, TX. So yeah, I'm a Conan fan. The book opens with a beautiful map of the Hyborian Age and a separate PDF of it is included. Conan: Adventures in an Age Undreamed Of is gorgeous, lovingly laid out, with crisp graphic design. You can tell the team loved this job and loves the source material. I particularly appreciated the color scheme of the entire book and it has some of the best art I've seen in a game book, much of it by well known comic artists. Forward and Introduction 1: The team shares their love of Howard and Conan and fill in some facts about the man and his creation. Chapter 1: Covers those new to Role Playing and what they will need. While it's not something I need, I can see new players and GM's being drawn to this property. Chapter 2: Covers creating a Character, which is a fairly in-depth life path system that connects you to the Hyborian Age. You will choose a Homeland, Attributes, Caste, Story, Archetype, Nature, Education, and War Story. Each choice provides the ability to increase Attributes, add Talents and Skills, and define Traits that allow you gain Fortune Points as you play. The Attributes are Agility, Awareness, Brawn, Coordination, Intelligence, Personality, Willpower with Vigor (physical Hit Points), Resolve (mental Hit Points), and Gold. A nice section on Hyborian names by Region is presented and options for a random table-based Character Creation method and a method for "larger than life" characters finish the chapter. I'm a big fan of life path systems and I think this decision connects your to Conan's world and was a sensible path to take. Chapter 3: Introduces the Skills of the game and their individual Talent Trees. Fortune Talents are also presented in this chapter. Skills have both an Expertise, which adds to the appropriate Attribute and a Focus, which creates the opportunity to score additional Success' on a roll. I like that Talents are tied to Skills, I think that ties the system together and keeps a new mechanic very relatable and easy to learn. Chapter 4: The core mechanic of the game is to choose the appropriate Attribute for a Task, add any Skill Expertise that might apply and attempt to roll equal to less than the total on 2d20 (certain Talents or Momentum may increase the number of d20 by up to 3 for a max of 5d20). Each die that does this is a Success, and if any of the die are equal to less than your skill Focus, each count as an additional Success. E.G., So if Conn, is striking with his sword, he would roll Agility (11) + Melee (Expertise 2, Focus 2). He rolls 2d20 and gets a 2 and 9, for a total of 3 Successes. The number of Success are compared to a Difficulty with a range of 0 to 5, generally set by the GM. If you have less Successes than the Difficulty your fail (but the rules want you to "fail forward"), if you equal the Difficulty you succeed, however if you exceed the Difficulty you generate Momentum equal to the difference. Momentum can be spent on that task or pooled for later use by the entire group. It can be spent to add d20's to a roll on a 1 for 1 basis, increase a target's Difficulty on a 1 for 1 basis, obtain information, improve the quality of success (including damage), increase the scope of success, or reduce the time required to perform something. The main mechanic is very easy to learn and yet has the mechanic depth to be interesting and expanded. Momentum takes a bit to learn and can easily be brought into the game slowly, as the group learns it. Chapter 5: Features the basics of combat, how many actions you get (a single Standard and Minor, plus any number of Free actions), and movement and range, which are handled by Zones and is designed to be Theater of the Mind. Weapon damage dice are d6's where a 1 counts a 1 damage, a 2 counts as 2 damage, a 3 and a 4 count as 0 damage, and a 5 and a 6 count as 1 damage with an effect generally added by weapon or Talent. The dice are added together and compared to a character's Armor, which provides a static soak number the reduces damage) and possibly a dice value such as cover or moral. If any damage is left it reduced from Vigor for physical attacks or Resolve for mental attacks, as Stress. If there is 5+ Stress than the character takes 1 Harm for each 5 Stress. If a character has 4 or more Harm of 1 type, they are incapacitated. Displays are techniques for warriors to intimidate and inflict mental damage on their enemies. I think it's inclusion sets the game apart and is appropriate to the world. Various Conditions and diseases are covered here. And finally riding animals and an example Action Scene round out the chapter. While reading through combat has taken me several times, I think it's nice hybrid of Hit Points and Wounds and would make sense after a few fights, at most. Chapter 6: Is the obligatory Equipment chapter and what I found most compelling were the qualities that could be activated on a roll a 5 or 6 on the damage die. There are also rules for layering armor, which I think perfectly captures the setting. Chapter 7: Features Sorcery and it's treatment is very dark and costly. The further one travels down the Sorcerer Talent Tree, the more is required for them to give up, including their soul. Sorcery is as much about cunning, alchemy, persuasion, and even handling animals as it is about spells. Petty Enchantments are items such as blinding powder or talismans and are very rich in detail. Patronage is also required for a Sorcery to gain real power. The Spells provided are not DnD spells, but things like Astral Wandering, Summon a Horror, or Dismember a foe. All spells have a consequence and the more powerful you become the more damned you become. In other words, its Hyborian magic. Chapter 8: The Hyborian World is covered in good detail and enough information is provided for a GM who has no real experience with Howard's works. Chapter 9: Lays out the GM's job and provides advice, it also lays out the Doom pool, which a player can add to if they are out of Momentum and need a boost. Doom is a tool of the GM, just as Momentum is a tool for the Players. A section detailing things that make a Conan adventure distinct form other genres is required reading and helps the GM keep things in focus for this world. Additionally, a section for life between adventures and experience and gameplay rewards round out the chapter. Chapter 10: Feature antagonists and encounter design. We learn about minions, toughened foes, and nemesis. Minions go down quick, toughened foes are harder, and a nemesis is a big bad. A good selection of mundane and horrific foes is included for the GM to use. Characters of renown from Conan's world round this chapter out. Chapter 11: Vultures of Shem is an introductory battle that pits the player's against ghouls and worse, human foes. It felt like it belonged in the Hyborian World and it's refreshing to have a intro adventure to mine for tone, even if you choose not to run it. Chapter 12: Defines heroes of the Age for use in your games. Prominent figures that your players may come across. An index is provided and the pdf is fully bookmarked. Pros: Strong writing, gorgeous layout, and a passion for the setting make the book indispensable for an existing Conan fan and a good introduction for new players. Character generation is filled with flavor and the game's engine is very elegant and intuitive. Cons: Character creation is more involved than most games and damage takes to time to grasp. Momentum and Doom are complexities that can be introduced slowly. Magic is very different from most fantasy RPGs and could be turn-off, but captures the setting. My advice: Buy this book if love Conan or if you are looking for a game system that is geared to skills and not classes. I can see it being a very attractive to groups who like elements of Savage Worlds and BRP. If you loved Mongoose's Conan for d20 (which I do), this book puts it to shame.